Having friends over for a dinner party, BBQ or for drinks on the patio can sometimes be more stressful than it should be. It can take a lot of careful thought and planning to find the perfect combination of food and drinks to serve that all your friends and family will like. With that in mind, we found some great apps that will help you plan the perfect meal. The app uses the GPS technology on your phone to connect with real-time inventory numbers at your local LCBO store. It also gives you the top 10 wines by price, type or score. Simple. Another awesome feature of the app is the smart-storage capability. You can scan your wine-cellar or cupboard into your phone so that when you go to the LCBO you don’t end up picking the same bottle up twice, or you can stock up on ones you know you like. Our favourite feature is the wine-pairings. Knowing which wine will go best with dinner involves more nuances than most of us are prepared to delve into. This app does all the hard work for you so all you need to do is walk in to the store and pick up the bottle. 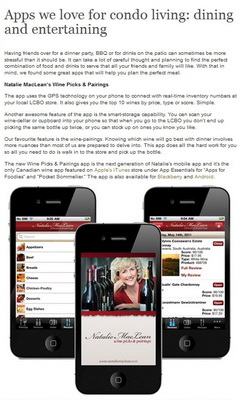 The new Wine Picks & Pairings app is the next generation of Natalie’s mobile app and it’s the only Canadian wine app featured on Apple’s iTunes store under App Essentials for “Apps for Foodies” and “Pocket Sommelier.” The app is also available for Android.